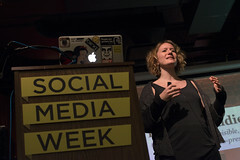 Last week was Social Media Week New York. And I went to every panel I could. I didn’t manage to get to all of the ones on my list. As is so often the case, there is just not enough time in the day. The panels I did get to see ranged over a variety of topics, from privacy to dating. They were so varied, in fact, that I was a tad surprised to see an over-arching theme come out of everything: Context. By context I mean understanding where, how and why a person is engaging with digital or social content. This affects not just a researcher’s efforts to understand the data presented, whether that is “big” or otherwise, but plenty of other topics that were brought up frequently at the various panels. Let’s start off with privacy, a very popular topic across the board. 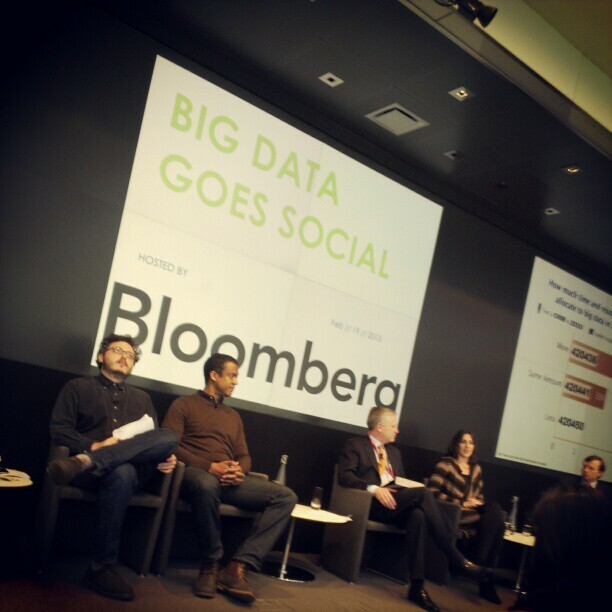 This discussion popped up during Francesco D’Orazio’s panel “Big Data Goes Social” hosted by Bloomberg, and there was even a full Key Note by danah boyd dedicated to it. The question here is how should we respect people’s privacy? On the one hand, much of what is online is public, open for all to see. But on the other, 32% of people (this number is surprisingly higher for millennials at 38%) don’t even know brands are listening in, according to this recent study. As Francesco said on his panel, people want to be in control of their own data, but unfortunately, that’s not how things are set up right now. Controlling and owning data, though, isn’t just being in possession of it, it’s controlling the context around it. According to danah boyd in her keynote speech, controlling the context of their online interactions is what people are trying to do when they attempt to protect their privacy. If we owned and controlled our data, this would be simple, but since we can’t, people use privacy filters and other tactics to control who can see their online posts. People don’t mind sharing things openly online, as long as that’s why we’re doing it. For instance, in that same research study, they found that over 40% think that listening in to online social discussion is intrusive, but almost 50% said companies should listen to improve products and nearly 60% said companies should respond to complaints. It all has to do with context. If a person is complaining, then join in and help – that’s why they’re doing it. If they are just mentioning a brand or having a personal discussion, then they don’t want a brand entering the conversation. Sure, if they could control their data and who sees it, that’d be the best. But barring that, if we understand the context people are talking in, we can understand which conversations are private and which a brand can safely join. And computers can’t do that. The need for human interpretation was another topic linked to this idea of context that sprung up frequently in the various panels I attended. Francesco made this point, too,during the “Big Data Goes Social” panel. Big data can provide the “what” but it takes a person to identify the “why,” often by looking at a variety of factors. There’s an emphasis these days on the collecting of data and the presentation of it. As Jonathan Perelman of Buzzfeed said during the “Social IRL” panel, data doesn’t tell the story and ads don’t tell the story. But the interesting part is the story, the why’s, not the what’s. And they are interesting because of the effect of context on marketing efforts, the third topic under this umbrella of context. It’s not just enough to know how many times something was shared, or viewed, or mentioned. You have to know the reasons, the situations, in short – the context. This idea of linking the service or marketing message directly into the context of the user was very applicable during the online dating panel “It’s Complicated.” Panelists from Match.com/OKCupid, How About We, iCrossing, and Talkify discussed how they are trying to link their services up with the immediate context consumers find themselves in. Sam Yagan from OKCupid and Match talked about the Crazy Blind Date feature that OKCupid recently released, which is all about skipping directly to the date, directly to the offline world, depending on your immediate locale. In a discussion about improving the algorithms used to match people up, the panelists began discussing mobile apps to help learn how a date went, so the algorithms could better understand the users. As Brian Schechter, Co-Founder and Co-CEO of How About We put it, in online dating there is more emphasis on the analog now, but it’s about getting back to the physical and using digital to track that. So after this Social Media Week 2013, I’m walking away with a sense of the growing importance of context not only as a researcher but as a marketer. Yes, there were plenty of other great and interesting things discussed – from the importance of training and dashboards, to trusting the data itself. But this is what I’m walking away with because I think context touches on all of those things, and more, opening up the discussion to more interesting and relevant directions. I also think this represents the biggest challenge: How to understand the context of online behavior so we can find even better, more actionable insights. Along the same lines,, analyze the responsibilities and social obligations of press in context of current media scenario in the country.